If you own your own business, you probably realize just how essential it is for you to have a security system in place. When many business owners think of security systems for their businesses, they often think of surveillance cameras and burglar alarms. However, not all business security systems are created equally, and different systems provide business owners with different levels and types of security. Before installing a security system in your business, you should step back and take a look at all of your options. By looking at all of the security systems that are available, you can determine which types of security systems you should utilize in order to keep your business safe and secure. Although you might not realize the importance of security in your business, you should realize that utilizing these security techniques is imperative in order to keep business running smoothly. Not only can you save a lot of money in the long run by implementing these techniques, but you can also keep your staff and customers safe with the help of a good security system. When surveillance cameras are used in homes, they are typically only installed outdoors in order to monitor those who enter and exit the property. In businesses, however, it is important to install surveillance cameras indoors. There are several reasons why you should consider installing surveillance cameras inside your business. First of all, these cameras can help you watch out for shoplifting; even if you do not think that there is a lot of shoplifting going on in your business, you might be surprised to find just how much money you’re losing on a monthly basis due to stealing. Indoor surveillance cameras can also help you keep an eye on what your employees are doing. Many business owners do not realize just how much of an impact their employees’ behavior can have on their businesses, but the things that your employees do can make or break your business. With indoor surveillance cameras, you can watch to make sure that your employees are opening and closing your business at the right time, and you can watch out for those who might be breaking your rules. Another thing that you can watch out for with indoor security cameras is employee theft. Although a lot of employers do not want to think about it, employee theft is more prevalent that you might think. In fact, some of your so-called best workers could be the ones who are stealing money from you. This doesn’t mean that you should immediately become suspicious of everyone, but installing indoor security cameras within your business can help you to make sure that your employees are not stealing your money or taking merchandise or business supplies. Along with providing you with evidence for these crimes, indoor surveillance cameras can come in handy if someone walks into your business with the intention of robbing you, whether your business is opened or closed. In all of these scenarios, your indoor surveillance cameras can give you the evidence and proof that you need so that local law enforcement agents and court officials can find and convict the person who has committed a crime inside your business. Although there are a lot of benefits to having indoor surveillance cameras, this doesn’t mean that you should neglect to install outdoor surveillance cameras as well. Just as in a residential setting, it is important for you to keep an eye on what is going on your property. It is impossible to watch what is going on at all times, but your outdoor surveillance cameras can provide you with this type of security. Placing outdoor surveillance cameras on your property can help you to determine everyone who enters and exits your parking lot or other areas of your property. Therefore, it will be easier for you to find out who committed the crime if something happens at your place of business. Not only can you track who comes in and out of your business in the event of a crime, but you can also watch out for crimes that occur outdoors. Things could be stolen from your property, or people could vandalize your business. These cameras can also help you to monitor the safety and security of your customers and staff, and they can help you to find out who committed the crime is someone steals something from someone’s car or commits another crime in your parking lot. When purchasing outdoor security cameras, make sure that you find the right type of camera for outdoor use. Indoor cameras cannot be used outdoors due to the elements, even if they are mounted in a covered area. Instead, you will need to purchase security cameras that are weather-resistant, or you will need to find protective casing that will keep your cameras from being damaged. You should also consider looking for security cameras that offer night vision or that switch back and forth from night vision to regular recording; this will allow you to capture clear and accurate surveillance footage regardless of the lighting conditions. Another thing that you must purchase when installing cameras inside and outside of your business is a digital video recorder. Digital video recorders work to record and store your surveillance footage from all of your security cameras, and they allow you to watch your footage when you need to. You simply hook these standalone devices to a monitor, which will allow you to watch your footage. When purchasing a digital video recorder for your surveillance system, make sure to purchase a recorder that has plenty of storage space; this will allow you to record months’ worth of footage. You should also look for a digital video recorder that allows you to transfer your surveillance footage onto another form of media, such as by burning this footage to a DVD or transferring it to an external hard drive or other device. This will allow you to keep footage for a long time, and it will also make it easier for you to turn your surveillance footage over to the police if necessary. Installing plenty of surveillance cameras inside and outside of your business will help you to maintain a certain level of safety and security, and these cameras are imperative components to your surveillance system. It can be expensive to purchase a lot of cameras, however, so you might not be able to keep an eye on all of your property like you would like to. In this type of situation, purchasing fake security cameras can be an excellent idea. Fake security cameras do not really serve a purpose other than as a decoy, but they can work to deter crime in many cases. They are also much more affordable than real security cameras, so you can purchase a lot of them for your business without spending a lot of money. If you decide to implement fake security cameras into your security routine for your business, make sure not to become too dependent on them. A lot of experienced thieves can tell the difference between real and fake security cameras, but a lot of petty thieves are not willing to take the chance. Consider installing real security cameras in the most important parts of your property, and cover less important areas with fake security cameras. For best results, make sure that you purchase fake security cameras that look real, and consider purchasing dummy cameras that blend in with your real ones. When used carefully, these dummy cameras can be highly effective in deterring crime on your property. Although there are surely a lot of valuable things inside your business, your money should always be a top priority. Therefore, keeping an eye on your cash registers is imperative in order for you to maintain a top level of security and to prevent the loss of money. Not only do you have to watch out for those who might try to rob your business, but you also have to keep an eye on your employees to make sure that no one is dipping their hands into your registers. Installing security cameras over your cash registers is one great way to keep an eye on things. These cameras will allow you to monitor what your employees are doing, and they can provide you with solid evidence if someone attempts to steal from your cash register, either during business hours or after your business has closed for the evening. You can’t always depend on cameras in order to prevent theft, however. Some crafty employees know how to void things out on your registers or to skip scanning a few items, so make sure that you watch out for this type of behavior. You can even purchase custom printers that hook up to your cash register and your camera; these printers will tell you what is being rung up at each moment, making is easier for you to detect any type of employee theft. Although surveillance cameras are highly effective when it comes to protecting your business, they will not alert you as soon as someone attempts to break into your business. Burglar alarms can, however, so they are a great addition to any commercial property. Installing a burglar alarm isn’t a huge investment, and it is one that you are sure to be glad that you made. When purchasing a burglar alarm, make sure that all of the potential entrances to your business are protected; don’t just look at doors, but think about monitoring your windows with your burglar alarm as well. Also, make sure that you hire a security company to monitor your burglar alarms at all times. 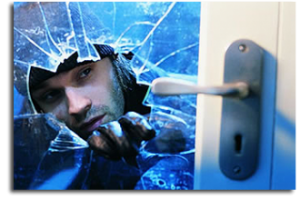 Although a loud alarm will scare off a lot of thieves and let those in the area know what is going on, a burglar can sometimes get away if law enforcement does not get to the scene of the crime fast enough. If your burglar alarm is constantly monitored, however, your security company will alert your local police force and will get in contact with you if one of your alarms goes off, which will help your local law enforcement agency to do something about the crime right away. Depending on the type of business that you run, you might want to consider installing access control equipment. This type of equipment can work to keep your employees and customers out of certain rooms, and it can even be used to make it impossible for unauthorized individuals to enter your building at all. There are several different types of access control equipment out there. One of the most common types involves swiping a badge in order to open a door. You can use this type of equipment to keep employees out of your office or other areas that you don’t want to have open for everyone, and it can be used for other purposes as well. Although purchasing a surveillance camera system and a burglar alarm is very important when it comes to keeping your business safe from theft and other crime, there are a few inexpensive things that you can do that will really make a difference. Installing plenty of lighting in and around your business can help you to get better surveillance footage, and it can also help to deter crime. Since criminals typically do not like to commit crimes in areas where they can be easily seen, you can often cut down on crime dramatically by installing lighting both indoors and out. With today’s energy efficient lighting solutions, you don’t have to worry about your utility bills rising dramatically by installing these lights, and purchasing lights typically isn’t a very large investment. With these simple additions, however, you can gain added security, and you will make your customers as well as your staff feel much safer as well.